Years ago, I took a trip to Provence, France, for cooking classes. One of the highlights of the trip was a visit to the weekend market at L’Isle sur la Sorgue, with vendors spread out along the canals and banks of the Sorgue River. Among the artfully arranged vegetable stalls was a rotisserie trailer, with a wall of spinning chickens ready for purchase. What grabbed my attention was the pile of potatoes under the chickens, soaking up the drippings and sold as a side dish. What a brilliant idea! I came home and immediately tried to duplicate those potatoes in my Weber, setting a drip pan full of potatoes under a pair of rotisserie chickens. But I had a problem - an hour later, the chickens were done, but the potatoes were not cooked all the way through. After some trial and error, I figured out that potatoes need a head start - the bottom of a grill doesn’t get hot enough to roast potatoes. I par-cook my potatoes in the microwave or in a pot of boiling water. That way, the potatoes are mostly cooked, and they only have to brown in the drip pan. Now, this recipe doesn’t need a rotisserie - it will work with any roast cooked over indirect medium or indirect high heat. You just have to remove the grill grate to get at the drip pan when the time comes to add the potatoes. These potatoes work with any meat - chicken, beef, turkey, and pork drippings will add flavor to the potatoes - but I could recommend a rotisserie duck? 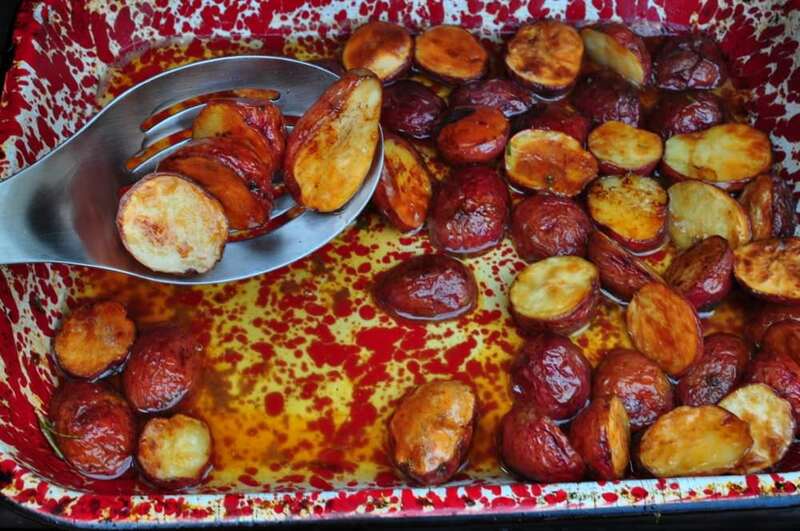 You haven’t lived until you try duck fat drip pan potatoes. Drip pan - aluminum foil is fine; what you see in the pictures is a 9 by 13 inch enameled steel baking dish that I only use in my grill. 1 1/2 pounds new potatoes (small red-skinned potatoes) or fingerling potatoes, halved lengthwise. Prepare the grill for indirect, high heat (450° to 550°F) and preheat it for 10-15 minutes. Start grill roasting the meat over indirect, high heat, with a drip pan under the roast. When the main dish has about 45 minutes left to cook, put your grill gloves on and carefully pour the potatoes into the drip pan, then spread them into an even layer. (When I’m using a rotisserie, I can carefully pour them directly into the pan; when I’m grilling a roast I have to move the roast and remove the grill grate to get at the drip pan.) Cook the potatoes, stirring and flipping after 15 minutes, until the potatoes are well browned and crispy. Watch the potatoes at the edges, right next to the heat, and stir them into the middle of the pan if they start to brown too much. Remove the drip pan from the grill. Be careful - the pan will be hot. Remove the potatoes from the pan with a slotted spoon, letting excess fat drip back into the pan. Taste the potatoes for seasoning and add salt and pepper if necessary. - Timing note: An average rotisserie chicken takes an hour to cook, so I get the chicken started, then move on to par-cooking the potatoes. 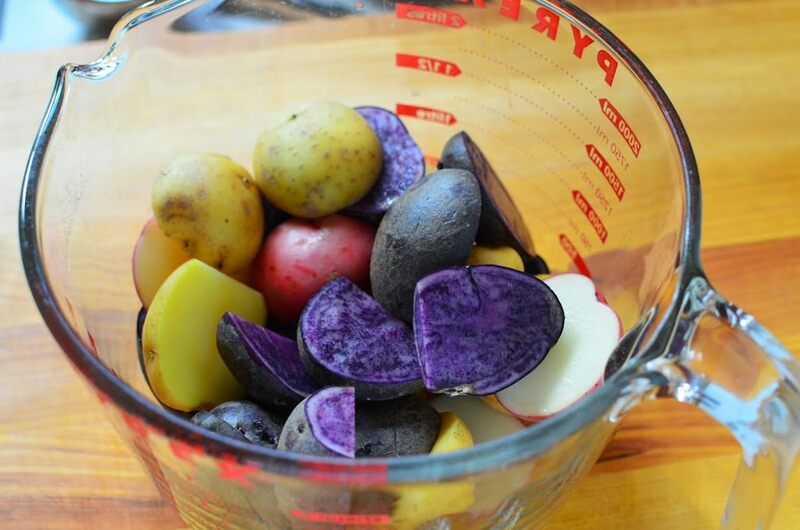 - I love the colorful mix of potatoes in the “par-cook” picture - it’s a bag of red, white, and blue new potatoes available at my local grocery store. But, it’s OK if you can only find red-skinned potatoes; despite the color variation, they all taste like potatoes when they’re done. Adapted from: Rotisserie Chicken Grilling by Mike Vrobel. Visit Mike at DadCooksDinner.com.